Lately I’m making a lot of recipes from my childhood. I’m sure it’s because I have my elderly Mom living in the house now. I know time is not on her side and the nostalgia is setting in big time! In the kitchen that I grew up in you could count on 2 things: There would always be coffee and there was always a coffee cake of some kind (Mom called it Kaffee Kuchen). I lived in a neighborhood of people ‘from the old country’. Doors were never locked and neighbors walked in at random. They would be presented with a cup of strong hot coffee and a slice of coffee cake. We had fruit trees and so the freezer was always packed with plums and apples and this meant that Pflaumenkuchen and Apfelkuchen were made year round. But when that was gone, the coffee cake was made without fruit and honestly it was quite good too. I’ll do a low carb version in an upcoming recipe. I really wanted to try making a keto version of coffee cake and I did have some blueberries in my freezer, so blueberries it was going to be! I also love the combination of lemon and blueberries so that was the taste I was going for. 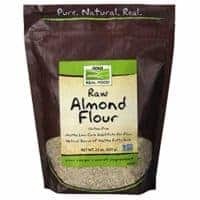 How do you make a low carb or keto version of coffee cake? For the bottom layer of the lemon blueberry coffee cake I used a combination of almond flour and coconut flour held together with eggs and butter. 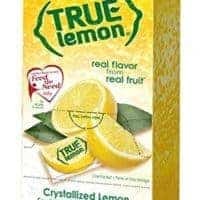 I used zero carb lemon crystals to get the lemon flavor. My Mom would have layered the fruit on top but I was worried about the moistness so I folded in blueberries, which are naturally low in carbs. I needn’t have worried, the cake is so moist! Just layer the fruit on top. Use lower carb fruits like blueberries, blackberries or raspberries. 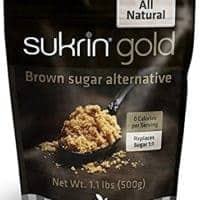 My Mom liked using a brown sugar crumb topping on her coffee cakes, so to achieve that I used Sukrin brown sugar replacement. Note: The blue links will take you someplace to purchase from in case you don’t have these ingredients on hand. Please note that I will earn a small commission if you do purchase but that will not affect the price you pay. I appreciate how my readers support my blog in this way! 2 silicon loaf pans, I use these exact ones. I am so happy with how this low carb coffee cake turned out! I had 2 people tell me that it tasted like something they would have bought at Starbucks! 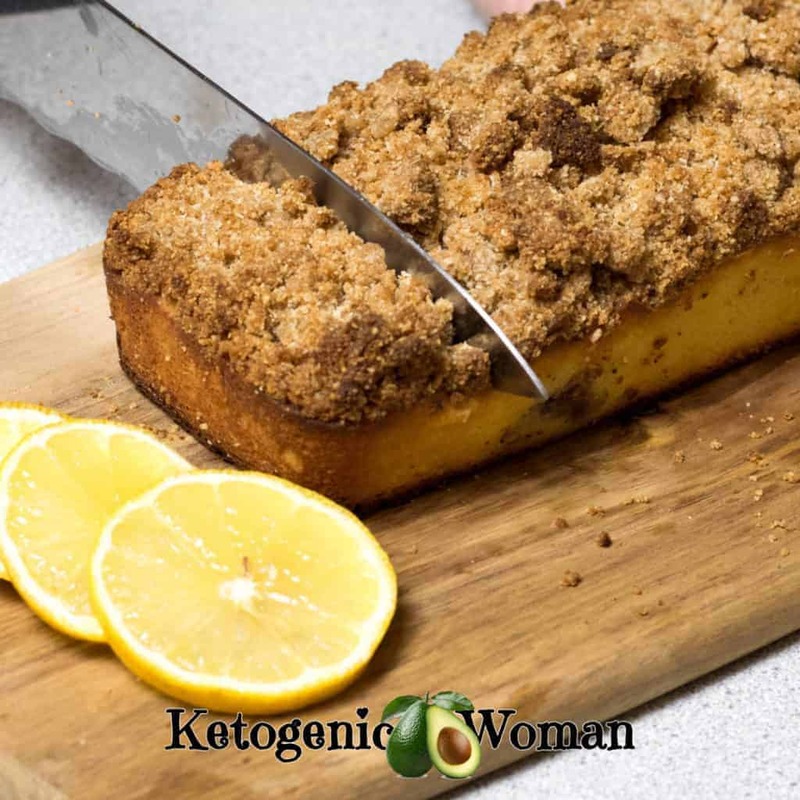 An easy and moist Low Carb version of the coffee cake that I grew up with. 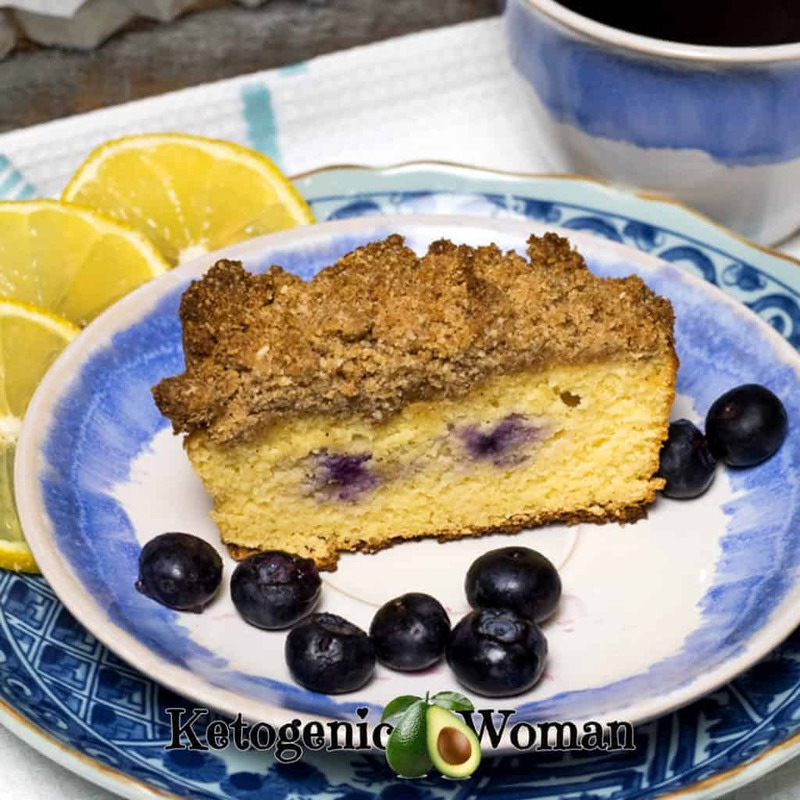 Serve this Keto Lemon Blueberry coffee cake with a steaming cup of hot coffee. With a wooden spoon, cream together the butter, cream cheese and sweetener. Add in True Lemon, almond flour, coconut flour, baking powder and salt. Mix on low with mixer until well combined. I like to work the ingredients into crumbles with my hands like my Mom did. BUT, the electric mixer also does a good job! Bake at 350 for about 20 minutes. Cover the loaves with a loose layer of foil so they don't get too brown. Bake another 10 minutes or until a toothpick inserted in center comes out clean. Allow to cool for 15 minutes before trying to remove from the loaf pan. I use a straight edge spatula and the loaf pops out nice and clean from the silicone pan! 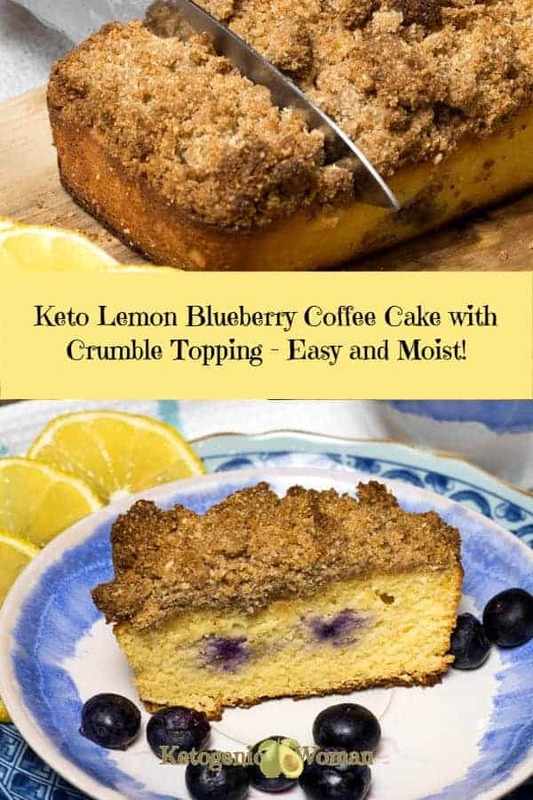 Save these Keto Lemon Blueberry Coffee Cake Loaves to Pinterest! 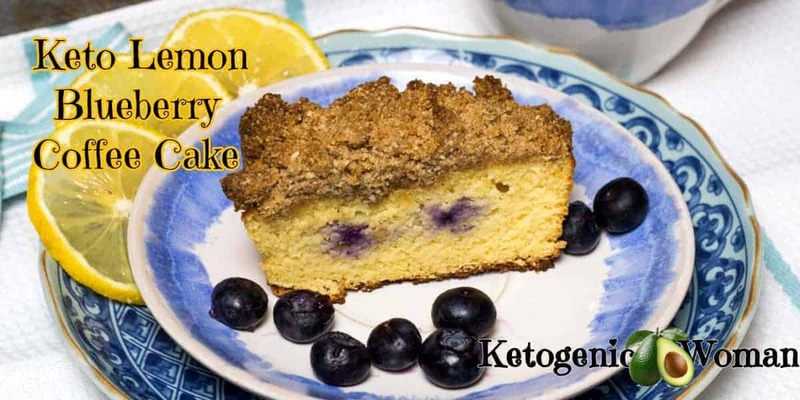 Tagged blueberry, lemon, Low Carb Desserts. Bookmark the permalink. In the UK, we call this type of almond cake ‘Frangipane’. I made it today, substituting raspberries for the blueberries, Lemon extract for the true lemon, and omitted the cinnamon (Just don’t like it!). It has worked perfectly – I only had a large loaf tin, so baked all the mix in one tin. It just took a while longer at a slightly lower temp after the first 20 mins. I’m glad the lemon extract worked out, I know that True Lemon is not available everywhere. I’ve also remade this recipe as Cranberry Muffins, just haven’t had the time to post the recipe on the blog yet. Coming soon! Thanks for stopping by!